Visit Facebook for news about Software Updates and Upcoming Shows. Quick Notes has developed a revolutionary Note System that allows you to easily create compliant notes in the treatment room or on the road. Your documentation and dictation literally fits in the palm of your hand! For over 23 years, we have offered the only ultra portable and flexible note systems on the market. PDQ™ is our Palm handheld solution that lets you tap your way through creation of a note. PDQ™ is easy, fast and gets the job done… so all of your SOAP notes and related documents can be completed in seconds. PDQ™ helps reduce the time spent on Documentation, and helps you reduce Medical Record Errors. Quick Notes has always been the industry leader in portable documentation, and PDQ™ is the essence of what we have always believed in. With this ultra-portable solution, you can complete your notes in the treatment room with patients, or anywhere that you happen to be! For our Chiropractic and PT clients, we have included Functional Limits and ADL's, Patient Statements, Goals, PART, and Treatment Plan. 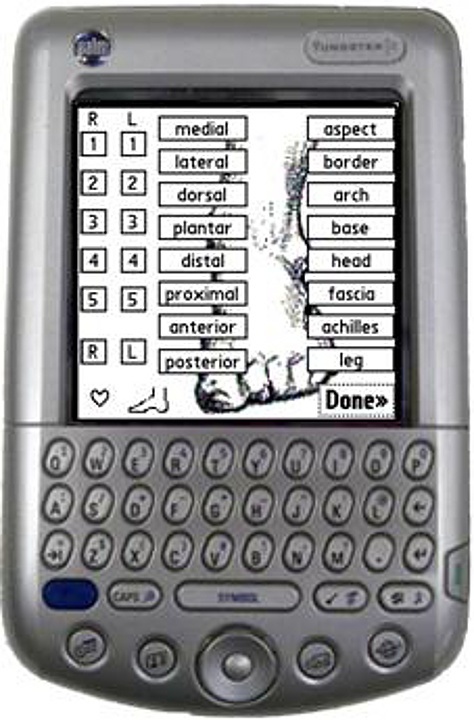 In addition, you can add optional modules for specific verbiage such as Exercises, Acupuncture, Posture and Nutrition. For our Podiatry clients, we include Patient History, Exam Findings, Class Findings and Medications. Plus, you can link PDQ™ to Intake Forms and Operative Reports. For Dermatology, we have created a Diagnosis-driven solution that is fully customizable and expandable. With top-10 drag-and-drop features, making changes to the system can be completed in mere seconds. Microsoft Windows is a registered trademark of Microsoft® | iPad is a registered trademark of Apple Inc.
©1988-2019 Copyright. Quick Notes Inc., all rights reserved. 10400 Griffin Rd. Suite 105, Cooper City, FL 33328 USA.